At dawn on Thursday, we were awakened by wind and snow falling on the tent. We got up and lit a fire, made coffee, and decided to see if conditions would improve. However, the winds grew stronger and the snow flurries grew more frequent and the temperature dropped. We were low on food and needed to get to Kirkwood. We went to the campground host and explained our situation. 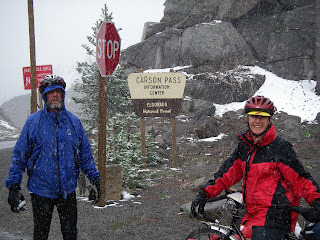 Jim Wagner offered all the assistance any bicycle tourist could expect; we used his phone to find accomodations in Kirkwood and he ferried all our gear (3 bicycles, 12 panniers, 1 dog cart, 3 people and 1 dog) the 5 miles over the Carson Spur into Kirkwood. This was critical due the winds on the ridges being in excess of 50 miles per hour. 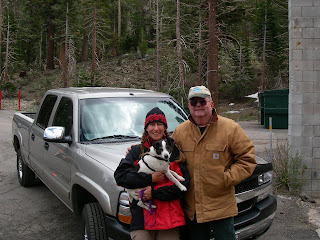 Here is Jim, Belinda and Jack after we unloaded. In Kirkwood, we moved into very fancy digs in a condo in a tower at the bottom of the ski slopes. We recovered from the cold and watched the snow fall all day. The weather forecast indicated improving conditions and less wind on Friday. So, this morning we packed up and headed down to the Kirkwood Inn for breakfast. Our waitress had come over the Pass and told us it was snowing, but not sticking. So after a hearty breakfast, we started for the Pass. At first the snow was light, then as we climbed it grew wetter and was sticking to the ground underneath aspen trees just leafing out. At the summit we paused for pictures and then started our descent. As we descended, the snow intensified becoming the wet heavy flakes so well known in the Sierras. We descended rapidly and got wet and cold. After only 17 miles, we stopped at Sorenson's, a well known mountain inn, to dry off, spend the night and wait until conditions improved. We had crossed the Sierra's in a snowstorm and were 10 miles from Nevada. What a fantastic story! Congratulations on passing over that very large obstacle. How wonderful to hear that people are still open to helping weary travelers on the road. You three are really inspiring. Mark, what's really inspiring are the good folks that do go out of their way to help strangers on the road. Our journey is still young and already there have been many kind people willing to help out in some way. Ok, so who is the guy with the beard? Has Dave given up shaving? Leslie, we were all cold, but Belinda always looks more put together than us guys! Hey, Carolee.. the bearded one is our friend Bill Brazelton, who we picked up in Sacramento where he lives. He is escorting us across Nevada till his vacation gives out.